"The band is fronted by Australian native Acey Monaro, whose sharp-tongued commentary and cunning synth hooks have garnered attention from audiences everywhere." "Storytelling remains Monaro's core appeal, her clever lyrics sharply observant and self-deprecating. The singer's meticulous craft strikes a cerebral fissure straight down the middle of her earworm compositions, a surprising bite delivered in candy coating." 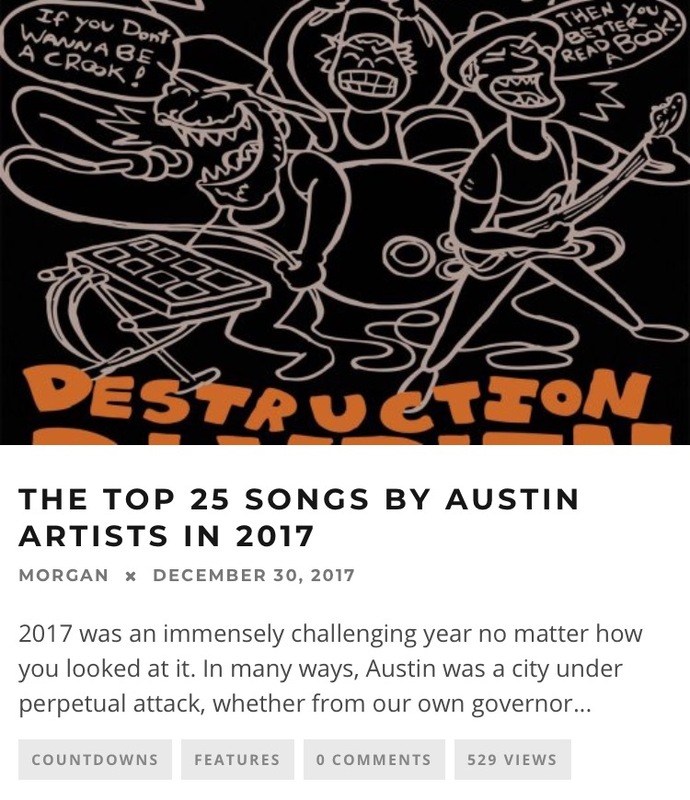 "Current Project ATX6’er Acey Monaro brilliantly weaves a rock and roll tapestry of cool, fun, and anything but vanilla and laces it with the razored tongue of a hardened heart." "Go Fever, however, manages to form a niche within their genre. They evoke the qualities of established, beloved bands without ever sounding hackneyed. “Surprise! I Never Loved You,” for example, feels like the middle ground between Courtney Barnett and the newest Tennis album. “Nobody’s Business,” is the perfect surf rock track for any summer playlist one could create. Song like “Folk Zero” prove that the band can go beyond their immediate genre. Perhaps my favorite song on the album, “Folk Zero” lightly infuses audio feedback without alienating the audience. This is a difficult task, and its achievement provides a full, tactile quality to the song." "Go Fever really shouldn't be this good already. They haven't been a band for very long, is what we're saying..but their very first album smacks of a band who knows exactly what they want to achieve musically and who has every tool at their disposal to achieve that vision." 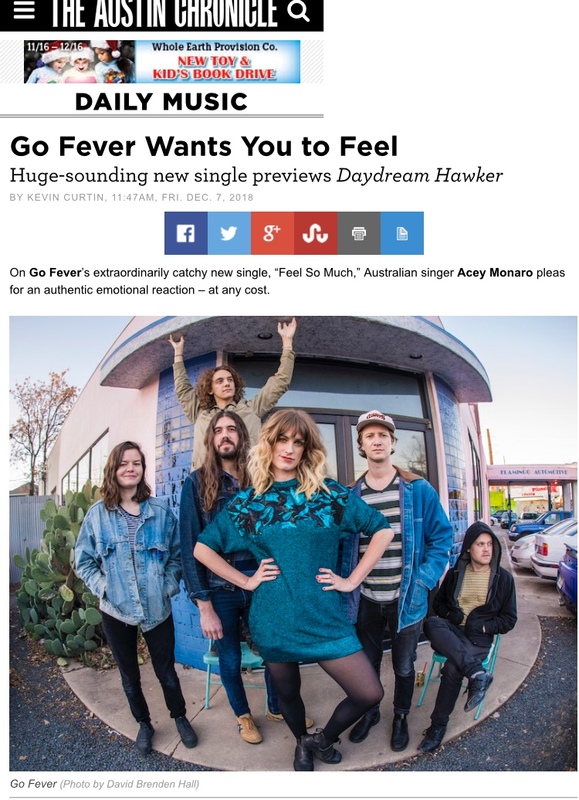 "Go Fever as an album firmly establishes that Monaro should be placed alongside titans of rock wit like Costello"
"Go Fever is a ten-song set of catchy new wave pop, with a solid alt-rock foundation and a bit of a throwback feeling to some of the tracks. Monaro’s vocals are infused with her distinctive Aussie accent, which brings to mind fellow Aussie, Courtney Barnett, as well as American vocalist, Angel Olsen, and bands such as Tennis and La Sera. Her lyrics are bold and can be irreverent at times, with the occasional word that can’t be played on the radio. The musicianship is exceptional throughout the album." 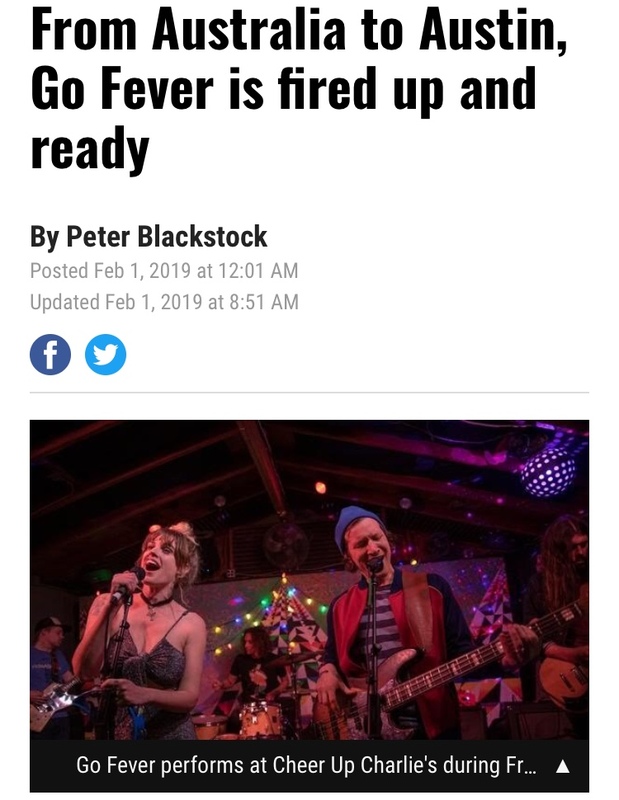 "Dropping on you like a new-wave charm bomb comes Go Fever, a pop-rock-meets-new-wave outfit who, in just 2 years, has gone from obscurity to ubiquity– making the ascension from hopping on bills where they can to becoming a go-to headliner for almost any booker and venue in this city. Equal parts charm and attitude is the magic formula here, brilliantly executed by their force of a frontwoman, Austinite-by-way-of-Australia Acey Monaro, who splices her charming melodies with razor-tongued, tell-off lyrics before letting it organically flow from her aura to yours and heimliching whatever pedestrian funk you’ve been choking on." "This Austin band stood out to me...Australian ex-pat Acey Monaro's big voice gives everything an extra punch." "Austin indie rockers Go Fever offer up a superb debut full-length album. Vintage organs ring out alongside buzzing guitars over rock-steady backbeats. Monaro’s melodies across the top are exquisite yet possess genuine rock teeth. It’s a divine dusty (and danceable) concoction that should sound equally great in a beer-soaked Dallas roadhouse or hip Boston draught house. Distinct well-crafted pop knows no boundaries. Buy it? Definitely." 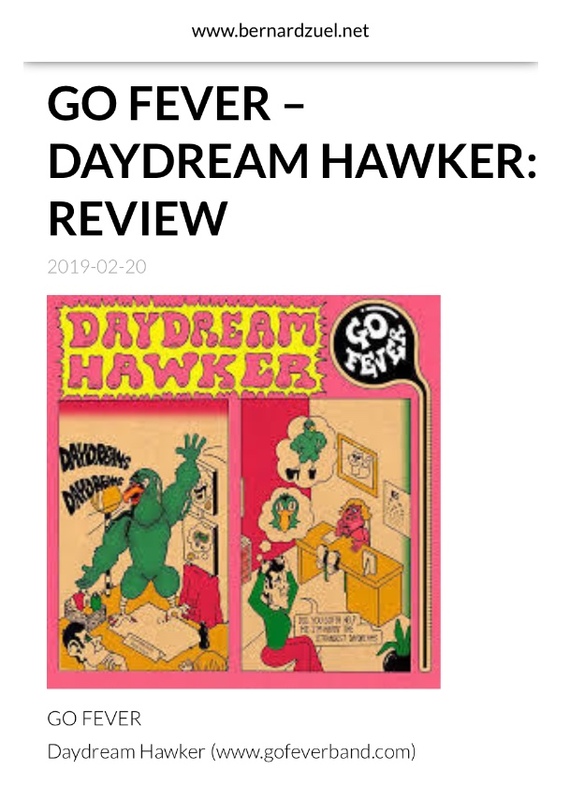 "Last month's self-titled debut solidified the frontwoman's penchant for fun, sophisticated pop with a gutsy LP living at the intersection of Seventies surf rock and twee." "...none of those songs caught me off-guard because they’re executed by strong scene acts. Then track 24 smacked me upside the head. Meet Go Fever, a prom rock quintet that sprouted locally last year. The song, “This Is Why We Can’t Have Nice Things,” aims Cupid’s arrow at the fleshy underside of love, with Monaro’s lounge singer enchantment rippling over ivories and glistening guitars." "Monaro’s charming vocal arrangements are incredibly accessible, featuring a handful of truly memorable hooks." "Their self-titled album built around Aussie ex-pat Acey Monaro’s solid songwriting was one of 2017 strongest debuts." 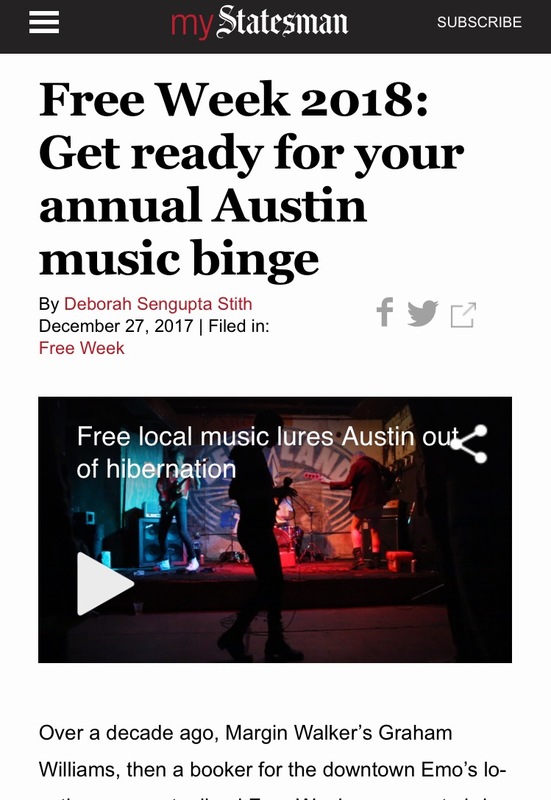 "The Australian expat has established herself as one of Austin’s finest songwriters and also one of its most restless, always eager to experiment with her sound." “'Surprise! I Never Loved You' is a showcase of everything that makes Go Fever contagious. Sunny vocals sliding off a sharpened tongue, fistfuls of pep, and a generous helping of their of Soul-meets-surf secret sauce." "'United States Of My Mind' is another fine track, the bands hallmark surf pop meets rock & roll sound is really engaging and the emotion in the vocals is notable." "Folk Zero is one track from their glittering debut, a song which showcases Go Fever’s pop rock kit in full force"